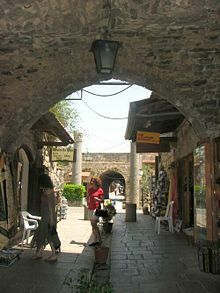 Byblos (Βύβλος)is the Greek name of the Phoenician city Gebal (earlier Gubla). The ancient city on the coast of the Mediterranean Sea served as the principal harbor for the export of cedar and other valuable woods to Egypt, which aided its development into a great trading center. The archaeological site, adjacent to the present-day city of Jbail, is about 20 miles (30 km) north of the modern city of Beirut, Lebanon. Byblos is believed to have been founded around 5000 B.C.E., and according to fragments attributed to the semi-legendary pre-Trojan war Phoenician historian Sanchuniathon, it was built by Cronus as the first city in Phoenicia. Today it is believed by many to be the oldest continuously inhabited city in the world. It is mentioned in the Bible in 1 Kings 5:18, referring to the nationality of the builders of Solomon's Temple, and also in Ezekiel 27:9, referring to the riches of Tyre. In 1984 UNESCO inscribed Byblos as a cultural World Heritage Site, recognizing the historic value of the ruins of many successive civilizations found there. It has been closely linked to the legends and history of the Mediterranean region for thousands of years, and is directly associated with the history and diffusion of the Phoenician alphabet. The Phoenician city of Gebal was named Byblos by the Greeks, because it was through Gebal that Bύβλος (bublos; Egyptian papyrus) was imported into Greece. The present-day city is known by the Arabic name Jubayl or Jbeil (جبيل), a direct descendant of the Canaanite name. Byblos (Greek) or Gebal (Phoenician) is located on the Mediterranean coast of present-day Lebanon, about 26 miles (42 km) north of Beirut. It is attractive to archaeologists because of the successive layers of debris resulting from centuries of human habitation. The site first appears to have been settled during the Neolithic period, approximately 5,000 B.C.E. Neolithic remains of some buildings can be observed at the site. According to the writer Philo of Byblos (quoting Sanchuniathon, and quoted in Eusebius), Byblos had the reputation of being the oldest city in the world, founded by the mythological Cronus, and was also where Thoth invented writing, but there has not been concrete proof that it is the oldest city in the world. During the third millennium B.C.E., the first signs of a town can be observed, with the remains of well-built houses of uniform size. This was the period when the Phoenician civilization began to develop, and archaeologists have recovered Egyptian-made artifacts dated as early as the fourth dynasty of Egypt. The growing city was evidently a wealthy one, and seems to have been an ally of Egypt for many centuries. The Amarna tablets include 60 letters from Rib-Hadda and his successor Ili-Rapih, rulers of Byblos circa 1350 B.C.E., to the Egyptian government. These deal with the conquest of neighboring city-states by the Hapiru. Objects have been found at Byblos naming the 13th dynasty Egyptian king Neferhotep I, and the rulers of Byblos maintained close relationships with the New Kingdom pharaohs of Ancient Egypt. Archaeological evidence at Byblos, dating back to around 1200 B.C.E., shows existence of a Phoenician alphabetic script of twenty-two characters; an important example of this script is the sarcophagus of king Ahiram. The use of the alphabet was spread by Phoenician merchants through their maritime trade into parts of North Africa and Europe. One of the most important monuments of this period is the temple of Resheph, a Canaanite war god, but this had fallen into ruins by the time of Alexander. In the Assyrian period, Sibittibaal of Byblos became tributary to Tiglath-pileser III in 738 B.C.E., and in 701 B.C.E., when Sennacherib conquered all Phoenicia, the king of Byblos was Urumilki. Byblos was also subject to Assyrian kings Esarhaddon (r.681-669 B.C.E.) and Ashurbanipal (r.668-627 B.C.E. ), under its own kings Milkiasaph and Yehawmelek. In the Persian period (538-332 B.C.E. ), Byblos was the fourth of four Phoenician vassal kingdoms established by the Persians; the first three being Sidon, Tyre, and Arwad. Hellenistic rule came with the arrival of Alexander the Great in the area in 332 B.C.E. Coinage was in use, and there is abundant evidence of continued trade with other Mediterranean countries. During the Greco-Roman period, the temple of Resheph was elaborately rebuilt, and the city, though smaller than its neighbors such as Tyre and Sidon, was a center for the cult of Adonis. In the third century, a small but impressive theater was constructed. With the rise of Christianity, a bishop's seat was established in Byblos, and the town grew rapidly. 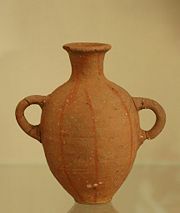 Although a Persian colony is known to have been established in the region following the Muslim conquest of 636, there is little archaeological evidence for it. Trade with Europe effectively dried up, and it was not until the coming of the First Crusade in 1098 that prosperity returned to Byblos. Byblos, under the name of Gibelet or Giblet, was an important military base in the Crusader Kingdom of Jerusalem in the eleventh and twelfth centuries, and the remains of its Crusader castle are among the most impressive architectural structures now visible at its center. The town was taken by Saladin in 1187, re-taken by the Crusaders, and eventually conquered by Baibars in 1266. Its fortifications were subsequently restored. From 1516 until 1918, the town and the whole region were part of the Ottoman Empire. Byblos and all of Lebanon was placed under French Mandate from 1920 until 1943, when Lebanon achieved independence. In the archaeological site of Byblos there are the remains of the Great Temple (also known as the L-shaped temple) built in 2700 B.C.E., Temple of Baalat Gebal built in 2700 B.C.E., and Temple of the Obelisks built around 1600 B.C.E. The Phoenician royal necropolis has King Hiram's sarcophagus, which bears one of the oldest alphabetic inscriptions yet discovered anywhere in the world. Byblos Castle was built by the Crusaders in the twelfth century from indigenous limestone and the remains of Roman structures. The finished structure was surrounded by a moat. Saladin captured the town and castle in 1188 and dismantled the walls in 1190. 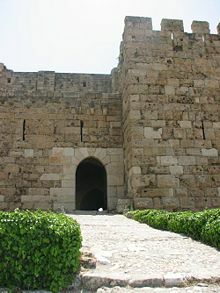 Later, the Crusaders recaptured Byblos and rebuilt the ramifications of the castle in 1197. It is located in the archaeological site near the port. This museum displays wax statues of characters from Phoenician times to current days. Work on the church started during the Crusades in 1150. It was damaged during an earthquake in the twelfth century and also during several conflicts. Byblos Fossil Museum has a collection of fossilized fish, sharks, eels, flying fish, and other marine life, some millions of years old. In the southeast section of the historic city, near the entrance of the archaeological site, is an old market where tourists can shop for souvenirs and antiques or simply stroll along the old cobblestone streets and enjoy the architecture. The earliest date back to the fourth millennium. 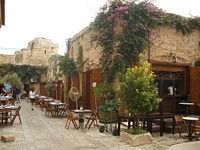 Today, Byblos (Jbeil) is a modern city. It remains one of Lebanon's biggest tourist attractions, mainly because of its rich history and scenic mountains overlooking the Mediterranean. 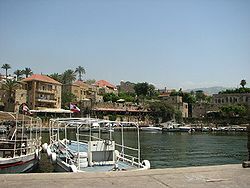 Most of the people of Byblos are Maronite Catholics. There are also some Shi'ite Muslims, whose ancestors escaped expulsion by the Seljuk Turks in the Middle Ages. The city of Bint Jbeil ("daughter of Jbeil") in southern Lebanon was founded by those displaced Shi'ites. Byblos has three representatives in the Parliament of Lebanon: Two Maronites and one Shi'ite. 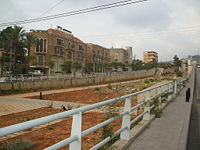 Byblos is the site of the professional campus of the Lebanese American University. The Byblos Campus is the home of the professional schools, including the Medical School, the Engineering School, the Pharmacy School, in addition to the School of Arts and Sciences and the School of Business. Tourism was once a very important contributor to Lebanon's economy, accounting for almost 20 percent of the GDP in the two decades before the start of the civil war. Since the end of the war, the sector has managed to revive somewhat, but tourism has yet to return to its pre-war levels. Tourism in 1999 accounted for 9 percent of the GDP. In 2001, the tourism sector was one of the fastest growing sectors of the economy, with the number of tourists visiting Lebanon between 1996 and 2000 growing at the rate of 14 percent annually. In 2003, the tourism industry contributed $6.374 billion to the Lebanese economy, and in 2005 the receipts per capita reached $1,433. In 2006, the Ministry of Tourism counted 373,037 admissions to the country's main ministry-run tourist sites. But the numbers for Byblos have dropped drastically, from 59,337 in 2004 to 36,341 in 2006, the latest year for which statistics are available. This can probably be attributed to the sectarian violence plaguing Lebanon, as well as the recent global economic crisis. ↑ Internet Sacred Text Archive, The Theology Of The Phoenicians: From Sanchoniatho. Retrieved February 4, 2009. ↑ National Economies Encyclopedia, Lebanon. Retrieved February 4, 2009. ↑ World Tourism Organization, Tourism Market Trends, 2006. Retrieved February 4, 2009. ↑ 4.0 4.1 Lebanon Central Administration for Statistics, Lebanese Republic. Retrieved January 31, 2009. Jidejian, Nina. 1968. Byblos Through the Ages. Beirut: Dar el-Machreq Publishers. OCLC 7630. MiddleEast.com. Byblos. Retrieved February 4, 2009. Nibbi, Alessandra. 1985. Ancient Byblos Reconsidered. Oxford: DE Publications. ISBN 9780951070406. Thiollet, Jean-Pierre. 2005. Je m'appelle Byblos. Histoire & découvertes. Milon La Chapelle: Éditions H & D. ISBN 2914266049. This page was last modified on 22 December 2016, at 16:29.